While its origins are unknown it can be traced back to the ancient world. It is only in recent times that it has been written down. The Greek philosopher Pythagoras who lived around 500 BC placed great importance on paying attention to the inner workings of the psyche. He used geometric figures to explain his teachings orally and he developed symbols of the first ten numbers. One of his seals is on the left and is now used to illustrate the structure of the system. We can also find traces of it in Plato and Plotinus. The desert fathers c. 400 AD, Sufism, Dante and Chaucer also showed knowledge of the system. It was known in the Russian court where the philosopher and one of the leading exponents of the material, George Ivanovitch Gurdjieff (1877 ? 1949), transmitted it. As far as we know he did not teach the Enneagram of personality fixation. This was introduced by Oscar Ichazo ( 1931 – ), a Bolivian, who taught it at the Arica Institute in Chile and in 1970 he brought together a group of 50 people from around the world and taught them the material. 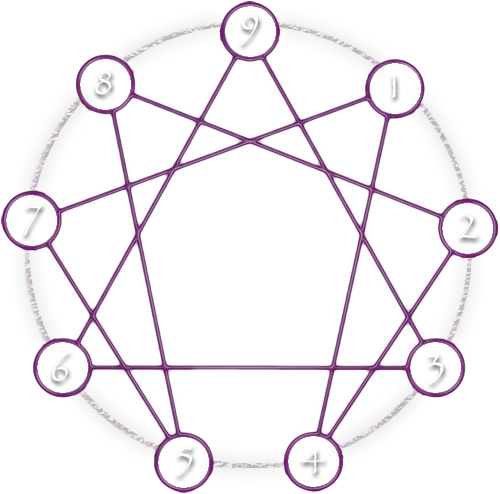 The Enneagram as it is presented in modern times largely comes from Claudio Naranjo, a Chilean-born psychiatrist, who was present at Arica and was an honorary faculty member at Harvard and Berkeley. He further developed the system and began teaching it in Northern California. From these sources others have made major contributions to our understanding of the Enneagram system, among them, Helen Palmer and David Daniels, Tom Condon, Don Richard Riso and Russ Hudson, and Jerry Wagner. More recently Beatrice Chestnut has contributed an overview of the material in her book, “The Complete Enneagram” and has incorporated most of the most recent work of Claudio Naranjo on the Instinctual Subtypes. She also illustrates the connections between the Enneagram of personality and Dante’s “Divine Comedy” which was written in the 12th century.